Hello everyone and happy weekend! Do you ever color your die cuts? It is one of my favorite things to do with dies! Today I am using quite a few of Memory Box’s newest dies to do just that! This card was I think my most-favorite from all the cards I colored. I LOVE the way the flowers pop off the navy background! I used the gorgeous Fresh Picked Flowers die set from Memory Box, along with greetings from the Sending You Love stamp set. The frame that the flowers are tucked into is another newer Memory Box die called Stitched Square Frames (they come in multiple, nested sizes). And then of course I needed to embellish things a bit! To do so, I used some Tonic Studios White Blizzard Nuvo Drops on the centers of each flower, as well as on the berries. This next card is bold and regal, with the beautiful Jumbo Peony and Fine Cut Leaves die sets. After coloring the peony and leaves, I adhered them all onto the card. 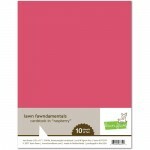 The peony is stacked onto three other peony die cuts, and the leaves are a single layer. To make the leaves dimensional, I adhered them only in the center portion of each leaf and then curled the sides for a bit of lift. 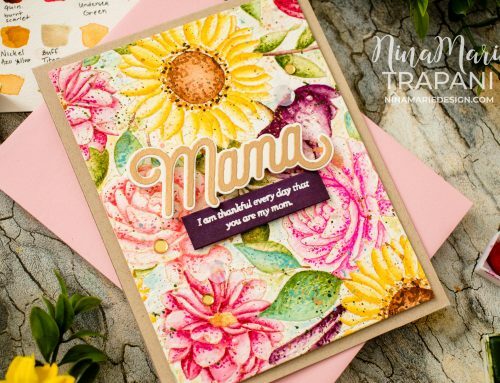 I carried the leaf pattern to the card base as well, creating a tone-on-tone effect with Fine Cut Leaves die cut from the same color of cardstock that the card base was made from. I adhered these all down onto my card with liquid glue. 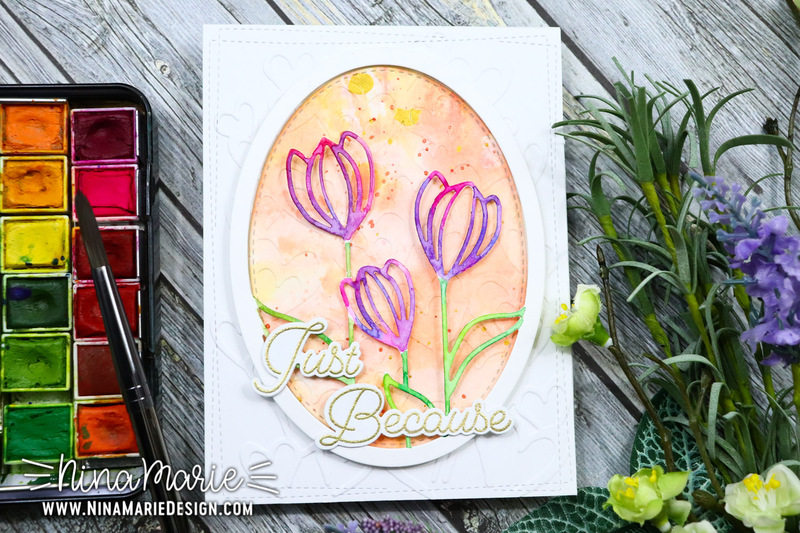 My sentiments are from the Just Because Birch Press Stamps greeting set, and I embellished this card with Nuvo Drops as well. This time I used Sugared Almond Pink and Rhubarb Crumble. 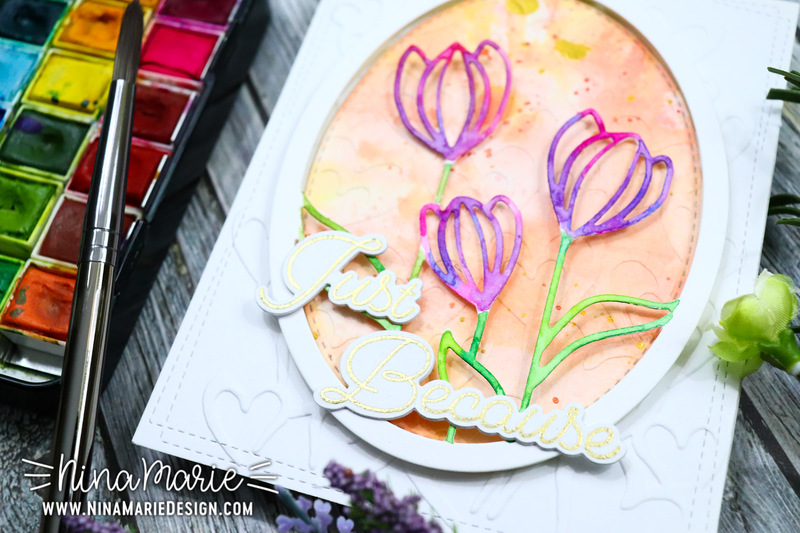 The die I used for this card is the pretty Floral Bloom Oval, which I adore! The previous cards you saw already featured Copic coloring; this one uses Prima Marketing’s Watercolor Confections instead. 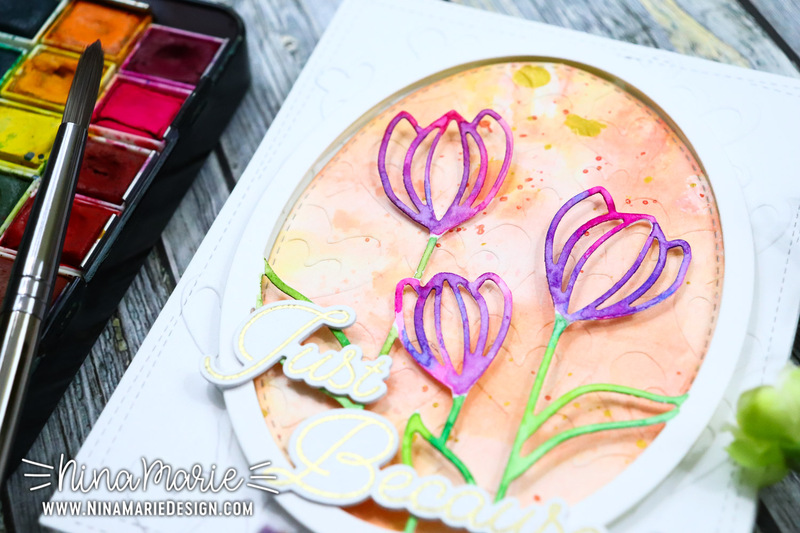 I love the different look the watercolor gives to the die cuts; I experimented a bit on this by dropping a few different colors onto these flowers. The variegated style is quite striking! The textured background behind the florals was made by ink smooshing Distress Oxides onto some watercolor paper; after the ink dried, I splattered gold paint onto it. Again after it dried, I brought in the elegant Envolee De Coeurs embossing folder from Carabelle Studios. I added a bit more of that distinct, dimensional texture, to the card base as well, which pulls the entire piece together. 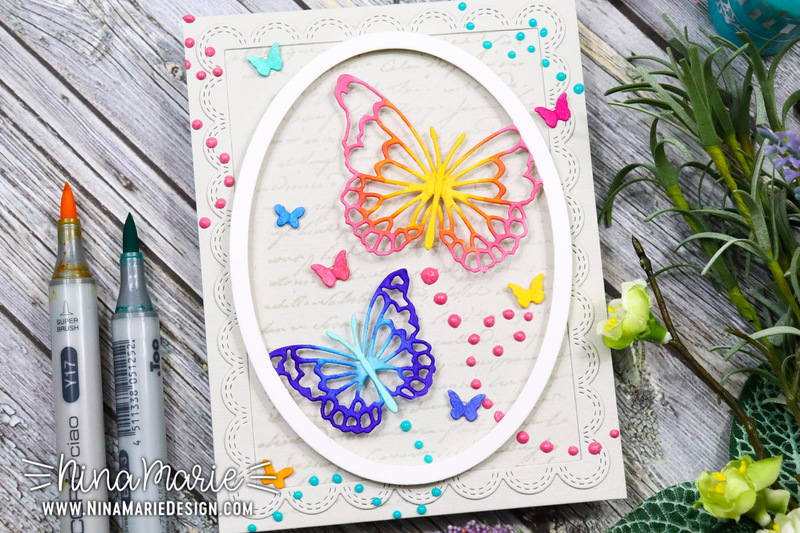 The final card I have to share with you features the stunning Avezzano Butterflies die, which is much like the Floral Bloom Oval die above. This time I used Copics again to color the butterflies, as I wanted them to be intense and stand out off the card. I layered the butterfly oval frame onto a gray card base that is stamped with the stunning script from 49 & Market’s 1787 set. 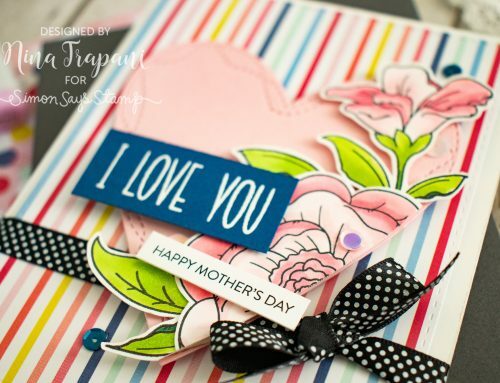 There is also a Double Stitch Scallop Frame die cut layered on top of the card base as well. When designing this card, I imagined these two large butterflies were fluttering about with a bunch of other butterflies as well. I create two “trails” following the large butterflies with Tonic Studios’ Bubblegum Blush and Caribbean Ocean Nuvo Drops. 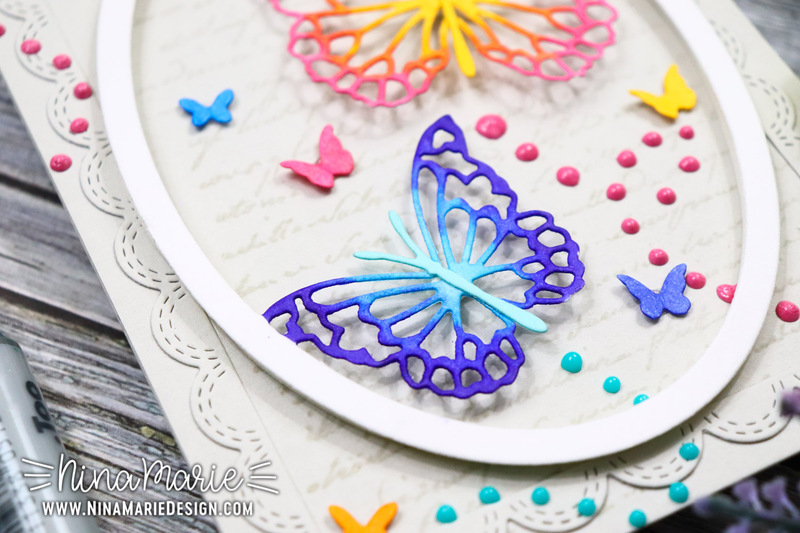 Then with the Mini Butterflies die set from Memory Box, I added teeny-tiny butterflies around the larger ones. 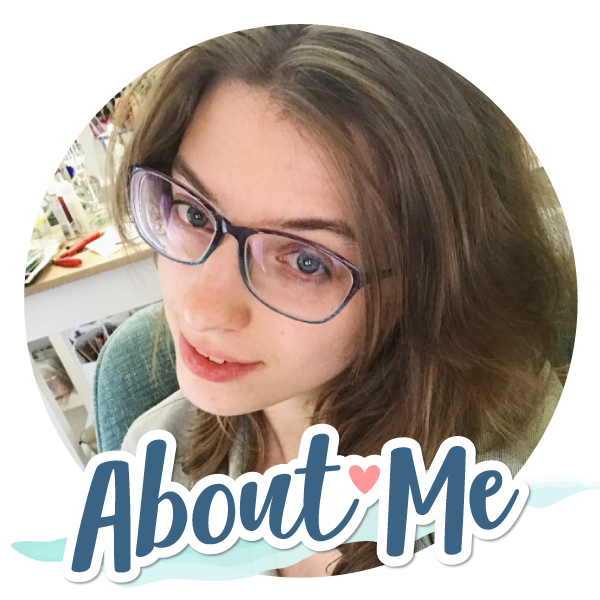 I purposely made sure they were smaller so that it created depth for my card. 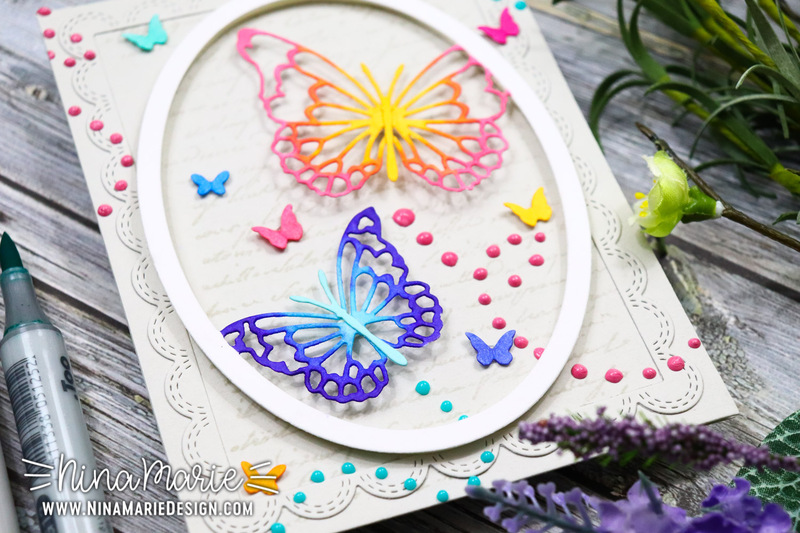 I ended up choosing not to place a sentiment on this card, as there was so much going on with the butterflies, that I felt a greeting would take away from their beauty. I can always place a sentiment inside the card if I need to. 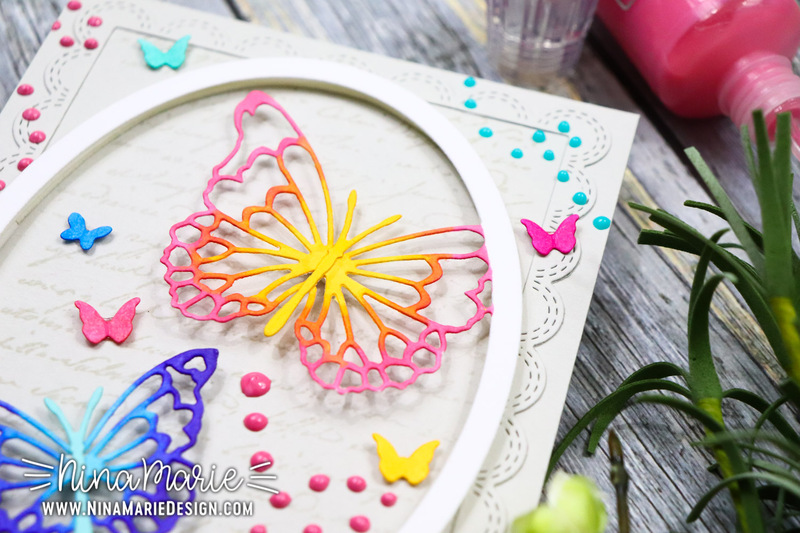 These cards were a lot of fun to put together and I hope you will watch the video at the top of this post to see how I colored each die cut! 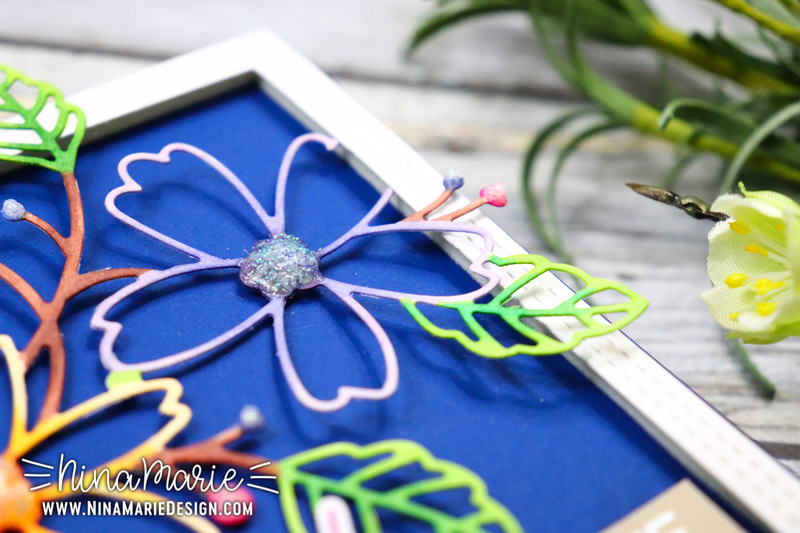 Thanks so much for visiting with me today; I will be back on Monday with a brand new Studio Monday to share with you, and quite a few other tutorials following that featuring brands such as, more Memory Box, Altenew, Simon Says Stamp and others! So stay tuned… Happy weekend! Never considered coloring my die cuts! I have a couple that would really benefit from that technique. Also, I love the butterfly card with the various Nuevo drop colors on it and how then mark the ‘flight path’ of the butterflies! YAY!!! SO happy to hear it was inspiring to color your own die cuts Joy!!! Love these beautiful cards. Thanks for giving us tips and the names of the products. Love the technique of coloring the dies. You did a great job! Enjoy your day! Awww thank you! So happy it was helpful!!! 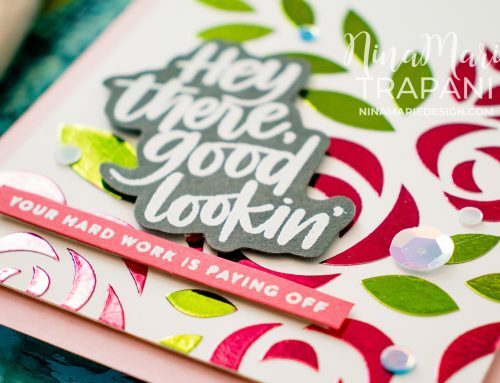 What fabulous cards and ideas Nina, I am totally going to be trying these. Thanks for sharing. You’re so kind Teresa! Thanks!! I hope you have fun trying the techniques!